Meet Goldilocks, the girl with lots of mischief on her mind. The story sees the inquisitive girl exploring and ultimately creating chaos in the three bears house! Help goldilocks to fill her rumbling tummy, fix little bears chair and make amends for her naughtiness. 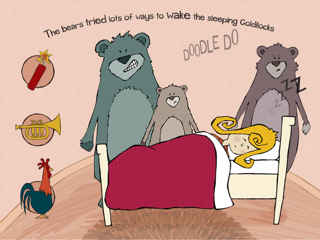 Goldilocks and the three bears is a delightful app of discovery and exploration. The beautiful illustrations, quirky sound track and engaging games will ensure little ones can enjoy this app again and again! Made by a tiny start up of 3 trying to demystify the world of app development and impress our kids along the way. Language: English Requirements: Compatible with iPhone, iPod Touch, and iPad. This app is optimized for iPhone 5. Requires iOS 4.3 or later. “Goldilocks and the three bears” is a charming, animated story that is interactive and based on the traditional fairytale that we all knew and loved as children. It is narrated by a by a little boy’s voice. The animated is rather charming. This cute take original kids’ tale teaches young children about size and comparison as well. It follows Goldilocks all the way from where she is picking flowers in the woods, even though she was forbidden to do to, all the way to when she is running out of the three bears’ house. When Goldilocks meets the bears, they make neat noises when you touch them. However, they are not happy about the state of their porridge bowls, or their chairs. Your child gets a chance to make baby bear happy again by fixing the chair that is broken. Your child can fix the chair by doing a puzzle. The angry bears wake Goldilocks in ways that allow your child to have have some interactive fun! It woke up my napping husband. That was rather amusing. In, what is a great lesson, they also have her clean up their house for all the trouble she has caused them. We are a small start up called Playfuel made up of 2 mums, with small children, who are making digital books and games for kids. 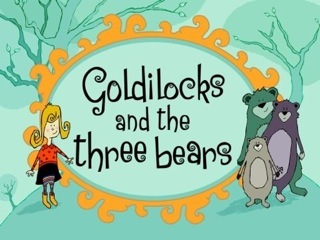 Goldilocks and the 3 Bears is our 1st app and we are really proud of it. We want to make beautiful apps for kids to fall in love with and parents to enjoy. Children are much better at adopting new technology than adults and so we wanted to give them traditional and beautiful stories in a format they will find common place throughout their life. Following the release of Goldilocks and the three bears we will be launching a series of Goldilocks adventures, which see her character interacting with other well know fairy tales. It took 10 months but to be honest working around school runs and school holidays meant it took longer than we had imagined. What is your favourite feature? My favourite feature is when goldilocks has to tidy the house. I think that’s because I thought of either of my kids tidying up would be a miracle! Size comparisons, to use reasoning to come to conclusions and moral reasoningWhat age range would this app most suit?